It’s Combat Wombat Time #GW2 #GuildWars2 – Nomadic Gamers, eh! 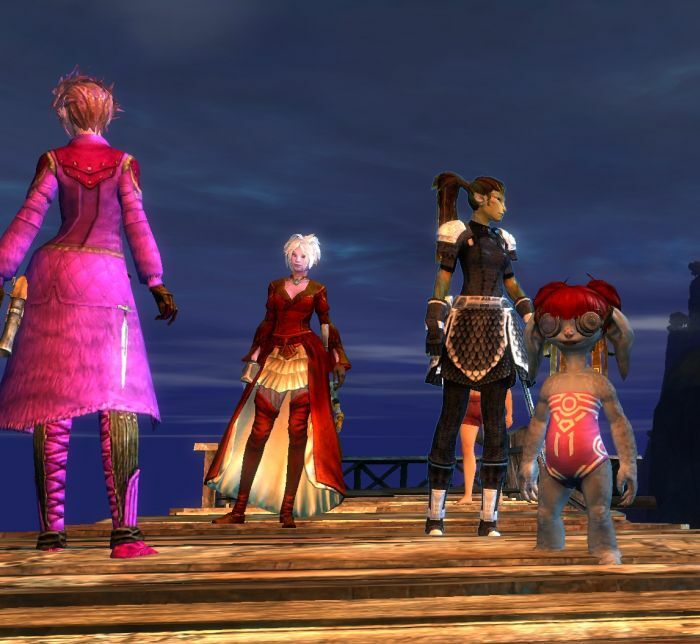 Yes, that’s my Asura decked out in the pink swim suit. So much awesomeness has been going on with the head start of Guild Wars 2 that I haven’t even had time to write about it until now, but I’m forcing myself to. First of all, despite numerous people having a rocky start to the game, mine was almost the complete opposite. I had one disconnect issue when I created my 5th character, but aside from that I’ve had 0 lag, and 0 issues (aside from the game wide ones like the auction house and store being down). I am confident in saying that GW2 will be one of my main ‘homes’ for quite some time, the game just caters to every single aspect of an MMO that I adore. I joined Combat Wombat on the Sanctum of Rall, most of the people in the guild are people I’ve “known” in an online manor for quite some time, but have never really been given the opportunity to group with or talk with before. That, and I’ve always been too shy. I decided to throw caution to the wind and the first thing I did was start to get to know my online friends better, participating in guild events and vent. I’m so happy I did, it was one of the best decisions I could have made. Game stuff aside (which pretty much everyone will be talking about) I had so much fun last night and during launch that I surprised even myself. Last night Combat Wombat hosted their first guild event, which included a pool party at the top of the diving board in Lion’s Arch. I REALLY have to give it to the developers, they did an AMAZING job giving players some roleplay features. If you stand at the top of the diving board you’ll notice a little footstool at the far end. Upon it are a pair of goggles. Put them on for hours and hours of laughs. Add a few dances to the mix, most of them by Sylvari and one very active Asura, and you’ve got a recipe for squeals of delight. Once we had danced until we just couldn’t dance any more (some of us quite literally, as we hit the rocks below the diving board by mistake) we decided to take on a hidden jumping puzzle that is located in Lion’s Arch (there’s another one in the Asura starter zone, FYI). If I thought the diving board was fun, wow, that was nothing compared to this. It was an incredible time, following guild mates from location to location, working our way through this puzzle. There was one part where I was shuddering in the dark, because guess what, the lights literally do go out, and all of the Sylvari decided to turn on their glow features to try to light our way. It was hilarious. Also, no, it didn’t work very well. Thought counts! Our reward at the end was a chest of (pretty useless) goodies, and an achievement for having made the trip. The game is great, there’s no question about it, but it’s really this group of people I’ve found myself playing with who make it an unforgettable experience. Thank you all.